That was the backdrop for a portion of U.S. Sen. Jeanne Shaheen’s visit to Franklin on Thursday, when she toured local storefronts, learned about the city’s renewed focus on its rivers, and attempted to calm business leaders in a community facing the turmoil of steep funding cuts in the Trump administration’s proposed budget. Shaheen stopped in at businesses set up with the help of Todd Workman and his group PermaCityLife, a nonprofit geared toward revitalizing the Franklin. Workman has been driving to bring new businesses and younger demographics to the city of 8,500, and he said a core part of his group’s work has hinged on federal community development programs set to be slashed in the Trump budget plan. Workman said PermaCityLife’s efforts have been aided by federal money from Community Development Block Grants, the Department of Agriculture’s Office of Rural Development and the Economic Development Administration. These programs all face cuts with the new Trump administration budget, according to Workman. Shaheen applauded PermaCityLife’s efforts and stressed her commitment to maintaining funding for federal programs facing cuts. Workman stressed the importance of federal funding to continue the growth in Franklin, which has seen 16 new businesses spring up in the last year and a half, he said. Key to Franklin’s revitalization efforts is not just driving new enterprise, but drawing a more business-friendly demographic to the city. Marty Parichand, the owner of Outdoor New England and the architect of a plan for a new white-water park, said he’s trying to do his part. Parichand said his white-water park would help infuse the city with life and a younger population. The push for changing demographics in Franklin is real. Twenty-four percent of its residents live in poverty and 60 percent of public school students received free or reduced-price lunch, according to City Manager Elizabeth Dragon. On top of that, the cuts in federal funding will hinder continued development, Dragon said, a bitter truth in city that favored Donald Trump over Hillary Clinton by a 15 percent margin in the 2016 election. Shaheen’s tour made stops at Colby-Sawyer College’s Sustainable Learning Initiative building, Franklin Clothing Company, coffee shop and restaurant The Franklin Studio, Toad Hall Art Bazaar, and Outdoor New England, all which said they started business in Franklin due to Perma City Life’s efforts. Acadia LeBlanc, a rising junior at Colby-Sawyer, talked about studied sustainability initiatives in the community while helping to teach water conservation at Franklin High School. 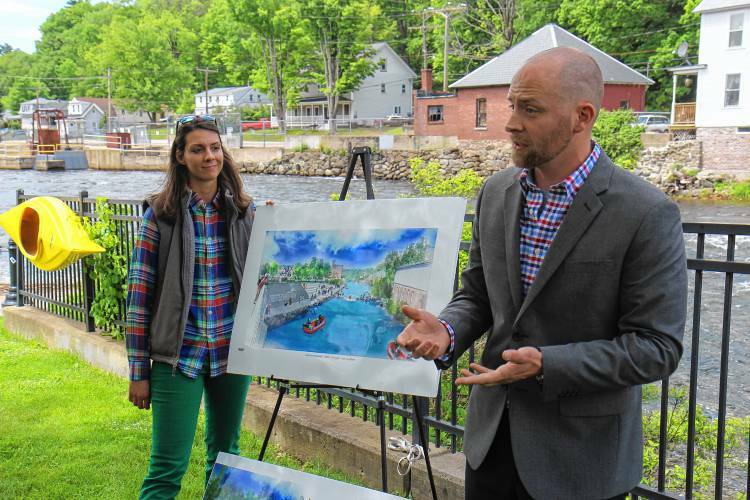 With white-water rafters traveling down the Winnipesaukee River behind him, Parichand said the ability to fuse his passion with revitalization efforts for the city was a great privilege.